Mobile value added services in India will rise to over Rs 55,000 crore in the next four years, according to consultancy firm Pricewaterhouse Coopers. The PwC report titled "Value Added Service: The Next Wave" predicts that by 2015, total revenues generated by VAS will cross Rs 20,000 crore while revenues from entertainment services will reach 25,000 crore and information services will contribute to Rs 7,900 crore. Multilingual content, application support around languages, killer applications and readiness of handsets will drive this growth. 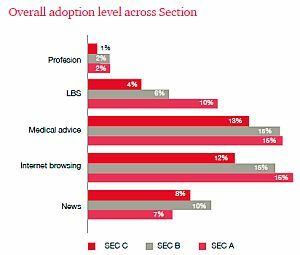 Among the factors that will affect future growth are rising demand to pay for regional and multi-lingual content; medical advice VAS; video calling and m-commerce. There is demand for news updates through VAS too. 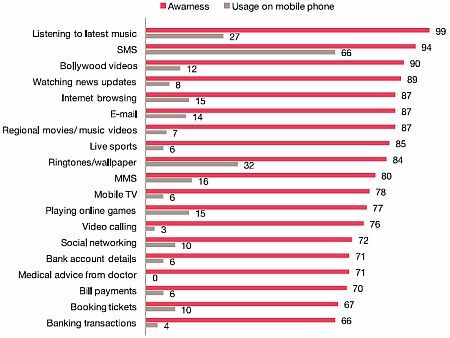 Consumers are willing to spend Rs 50 per month on regional entertainment, PwC states. Interestingly, 49% of users surveyed were willing to adopt the medical VAS in future at a price of Rs 73 per month. The survey reveals that users are willing to spend an average of Rs 51 per month for news on the mobile. The PwC report predicts that SMS as a percentage of mobile VAS revenue is expected to decline to around 25% by 2015 from current levels of around 60%. The report was focused on urban India and covered 1,050 respondents across 10 cities - Delhi, Mumbai, Hyderabad, Bangalore, Chennai, Bhubaneswar, Kochi, Ahmedabad, Pune and Kolkata. It also looks at the awareness levels versus usage. In rural India information based services such as "Behtar Zindagi" by Handygo Technologies continue to be deployed, which delivers daily data on weather information, agricultural market prices, livestock and health to mobile phones.